though, finding the time to pick out and decorate a tree can be a challenge in itself. So what if all this work was done for you, including clean-up and disposal of the tree after the holiday season? Look no further. 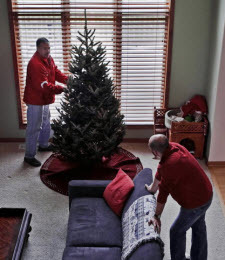 GMS offers complete in-home delivery, setup, cleanup and removal of fresh-cut Christmas trees. We’ll even put on the lights and ornaments. Could it get any easier, or convenient? Our trees are hand-cut on the day of delivery, ensuring that your tree will be freshest, most fragrant one in Brookfield, Elm Grove or New Berlin. Because your tree is literally “right out of the woods,” it won’t drop its needles – unlike trees sold elsewhere, which sometimes are cut as early as the first week of November. Our tree selection includes balsam firs, frasier firs, spruces and pines. We’ll set up your tree in a stand, water it, and even put on the decorations. After Christmas, we’ll pick up the tree, clean and vacuum surrounding floors and furniture, and dispose of the tree. Our Christmas tree delivery service is guaranteed to save you time during an already busy season. You just sit back, relax, and enjoy Christmas with a tree that brightens the home for all your family. Call or click to receive a quote for the delivery of a fresh Christmas tree to your home.